Update: This recipe is now available in video form! 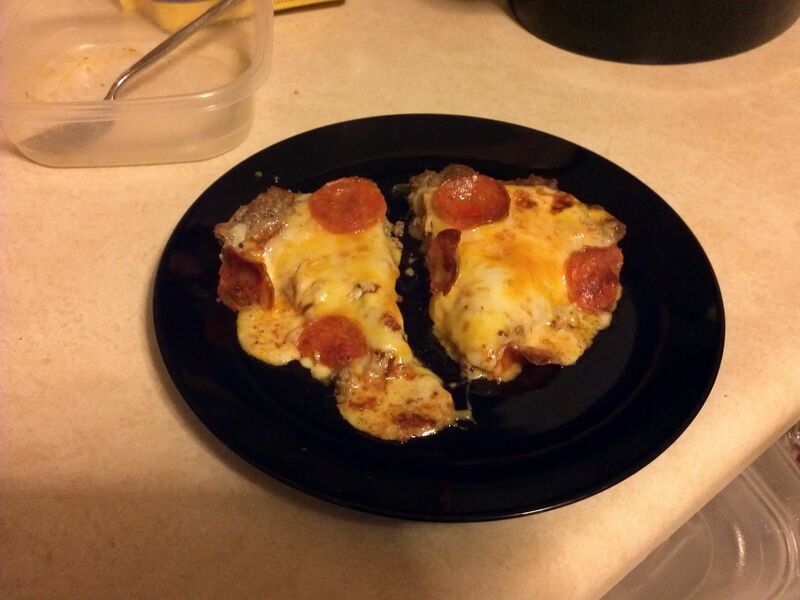 Meatza! This is a pretty common keto staple meal. 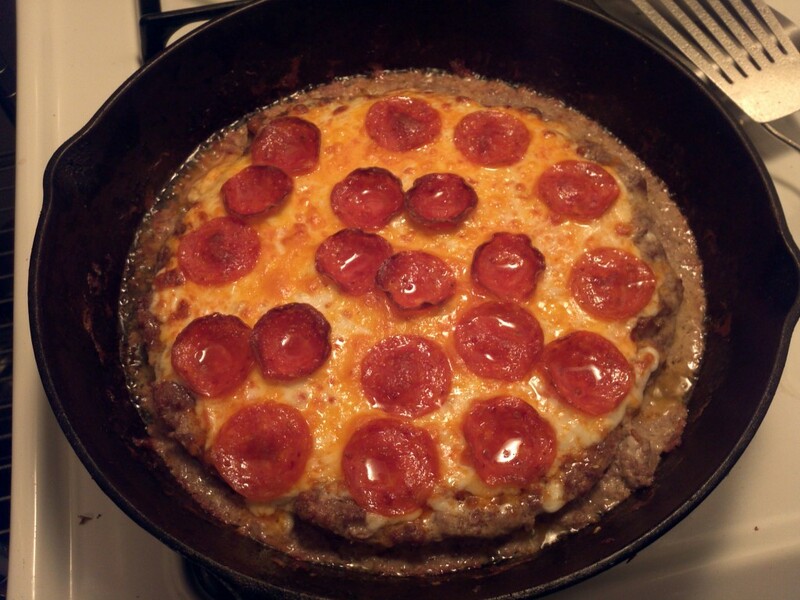 Its pretty easy to make and looks just like pizza, but its Meatza! Here is the finished pieces! You can put any toppings on it, I did just pepperoni and cheese. Any meat can be used, I used ground beef with a little seasoning in it. Cook the crust in the oven. It will shrink a decent amount but that’s ok! Spread some pizza sauce, cheese and pepperoni. Whenever I fry ground beef (for tacos) there is always a TON of grease that I have to pour out before I add other ingredients. I notice here that you initially cook the meat by itself in the oven. 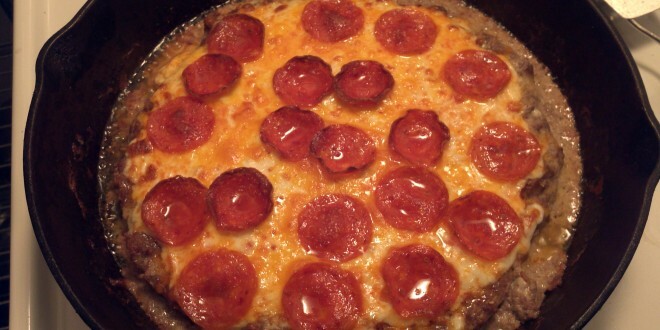 Do you pour out any fat/grease after the meat crust is done? I just left it in there for this process but you could drain it. The crust shrunk a little during the cooking but the fat level was below the crust so it didn’t effect the rest of the cooking. I was wonder what the nutritional value of this dish was? And also, what kind of sauce did you use? Put it in the oven first and didn’t have that much trouble with the grease. This dish was awesome and thanks to you I can eat it for 3 more days,thanks for helping the less creative with this site ! Just made this. A deliciously brilliant dish. Loved it! Doesn’t pizza sauce have a lot of carbs? Is there a substitute that you have used before in the past? There are two different sauces I use, both are relatively low carb. One is Rao’s Homemade line. They have a few different ones, for pizza I’d probably use their marinara sauce. There is also casa vino which is super low carb as well. I just go to the grocery store and carefully examine the labels till I find the lowest carb ones. If you can find them, they are around 3-4 carbs per serving which isn’t too bad. 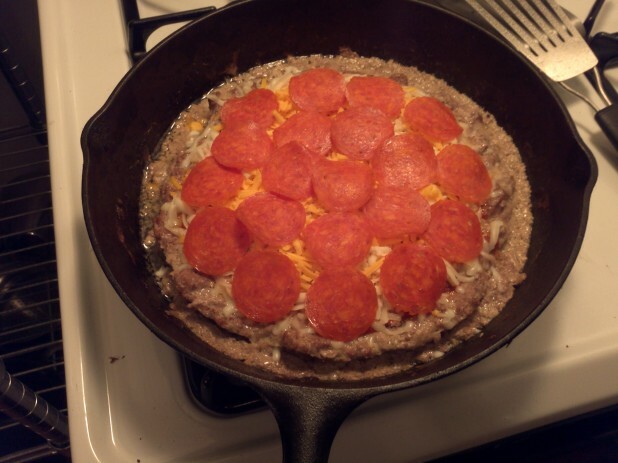 If you were to just grab generic pizza sauce, yeah it could be 10g of carbs per serving. I want to make sure I am understanding the nutritional data: it’s 610 calories per 1/4th of the pizza or 610 for the whole pizza? Sorry if it is a silly question but that seems very calorie dense for one slice. 1/4th of the pizza is 610 calories. Thanks – love your recpies! My husband made this for us last night and it was SO super yummy! Thanks so much for the recipe!! I just made this recipe only I added some ground pork with my grass fed ground beef for my crust…it was super delicious! Thanks for sharing your recipe!! What size cast iron skillet would U recommend? A lot of keto recipes call for eggs, but unfortunately they do not agree with me. Is there any way to make a substitution or make it without eggs? I know things like quiche would be impossible to sub but what about other recipes? Thank you! Eggs are just a binder. I usually don’t have an issue making meatballs, hamburger patties, etc. without them. You should be fine to omit them, just know it may not stick together so well. I have just made this and the mozzarella has left me with a very watery top! Did you put your mozzarella under your chedder and if so did that stop the wateriness? Thanks for all of these awesome simple recipes!! So I made this and the crust had scrambled eggs mixed in it. Can you tell me what I did wrong? just a guess. beat the eggs first and make sure they are very well blended into the meat. also, i believe the recipe would work without the eggs. 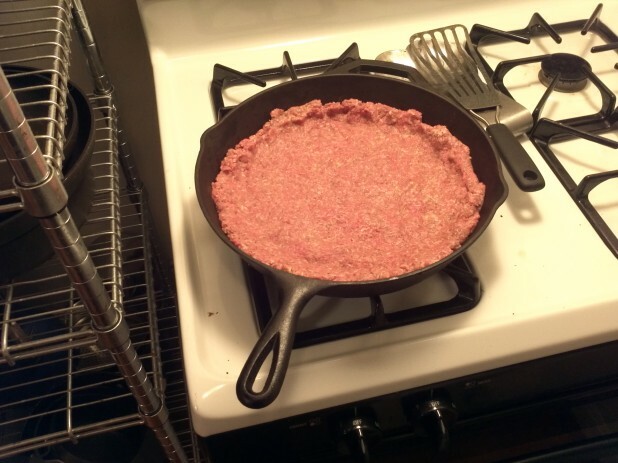 the meat crust would just be heavier. I usually just throw the eggs in unscrambled and “knead” them is gently. It’s ok if you can see a bit of egg. It’ll all eat the same!